Congratulations to our $10,000 winner, Team Amplify! 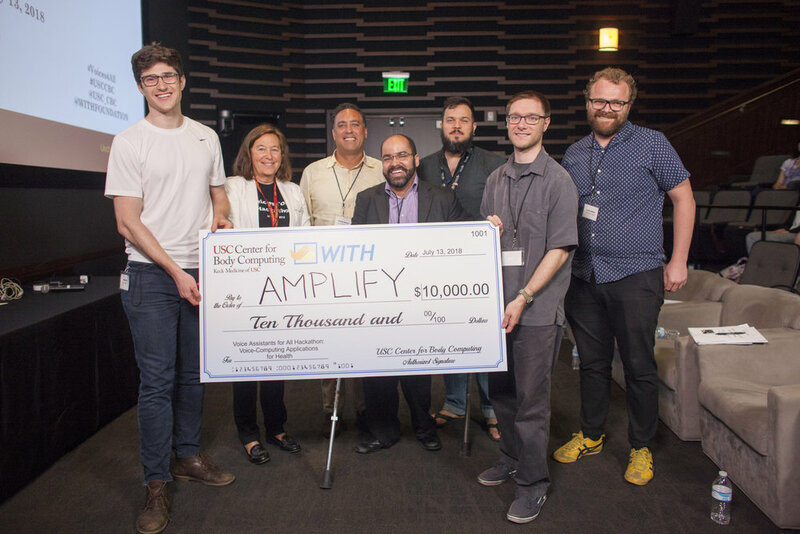 Executive Director of the USC Center for Body Computing Dr. Leslie Saxon, and other Hackathon judges, present the $10,000 check to the winners, Team Amplify. Check out PC Magazine's coverage of the hackathon here! USC Center for Body Computing and WITH Foundation are working together to ensure that the future of digital health includes the perspective and experiences of all individuals. The current U.S. healthcare system provides inadequate consideration for the needs of many groups, including Individual with Developmental Disabilities, seniors, and veterans. There are many reasons for this, including inadequate resources, time constraints and a lack of understanding and knowledge of the unique needs of these populations. We think emerging digital technologies can help. Health care advocates are valuable for many populations, assisting the individual and the care team by providing much needed explanations of medical conditions, and the ability to assist patients with communication of their needs to providers. Much of our health is shaped at home, where we typically begin and end each day. The challenge is to use a home-based voice controlled intelligent personal assistant driven by artificial intelligence (AI) to develop a health advocate for all populations. We extend thanks to Orbita, Inc. who will provide development sandboxes to developers who wish to use the Orbita Voice™ platform. See FAQ for more information.